The festive season is fast approaching and you might find yourself thinking about home improvement before Christmas begins. You are inspecting your property and you look up and you see a popcorn/ stucco ceiling. You might say to yourself: “boy, would I love to get rid of that old-fashioned texture!”. 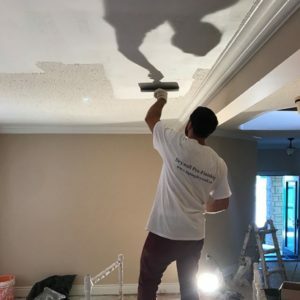 “Besides, it would be great to have a smooth ceiling rather than a popcorn ceiling after all”… And you are thinking correct, a popcorn ceiling is a thing of the past and if you’re looking to renovate, getting rid of it is a great idea! Once you are ready, quickly but carefully scrape out the popcorn ceiling. After all of the popcorn ceiling has been removed, sand the ceiling down. Wipe the ceiling down, ensuring no dust is remaining. Scan for bumps and imperfections and then prep the ceiling for smoothing and then finally apply the drywall finishing. After applying the drywall finishing, let the drywall finish rest for approximately 14-24 hours. Then apply prime coat to ceilings with a water-based primer. Apply one coat of paint to ceiling of any one colour of your choice. Remove all masking carefully and then proceed to clean up. And, there you have it a smoothed, finished ceiling that is ready for you to enjoy! Your best bet is to have the professionals do it like Drywall Pro-Finishing. Like this you will save time, money & resources. With decades of experience we know how to take care of your ceilings properly and have the job done right. Our professional workers will guide you and show everything that has been done step-by-step with always keeping safety in mind. Why not give us a call today to hear how we can complete your popcorn/ stucco ceiling removal today? As always we are looking forward to be in touch with you and stay tuned for more drywall-related news, info and advice from Drywall Pro-Finishing! This entry was tagged ceiling, GTA, popcorn, toronto. Bookmark the permalink.